The Indiangrass Wildlife Sanctuary in east Austin may be the only place I’ve ever seen Dalea* enneandra. That plumy species, which is apparently called nine-anther prairie clover, makes its debut in these pages today. This is also the first picture to appear here from the hundreds I took during my outing to the sanctuary on July 22, 2014. Most of the things that I photograph by the wayside go by the wayside, at least when it comes to revealing them to the world. It’s not that many of the pictures aren’t worthy, but there isn’t time enough to deal with more than a small fraction of them. * As you’re trekking over hill and dale, dally a moment and be sure not to confuse Dalea with Dahlia. The first pays tribute to the English botanist Samuel Dale, while the second honors the Swedish botanist Anders (or Andreas) Dahl. I looked at an aerial view of this area. Do you just park on the side Bloor Rd.? Unfortunately Indiangrass Preserve isn’t generally open to the public. To visit, you have to go on one of the rare field trips offered by the City. This is very worthy. Exquisite. And in this case not well known. One of my favorite poems is “Elegy Written in a Country Churchyard” by Thomas Gray. stanza when finding a flower or student or whatever that might not be appreciated or recognized. So many wonders of nature! You see the beauty everywhere. What a great trait, gift! Beautiful shot and know the feeling of so many photos. Ah, yes, what to do with them all? It must always be hard to select among the photos. This one is certainly a wonderful choice. I enjoyed your footnote about the name, too. I’ve often thought I spend too much time deciding which pictures to process and post. I’ll try to be quicker about it. I usually Latinize (or semi-Latinize) my botanical pronunciations, but most other people don’t, so I’m not sure how Americans actually pronounce Dalea. I’m guessing it comes out pretty close to, if not the same as, Dahlia (which I have heard pronounced). This is a wonderful photo of a clover flower. When thinking of flowers we don’t often think of grasses or trees, so I always think it is fun to turn focus onto them as you have here. In most people’s minds flowers trump every other botanical entity, so to compensate for that I do include other things that I get good pictures of, like the grasses and trees you mentioned. Similarly, when it comes to little critters, people are taken with butterflies, so I include bugs and beetles and spiders (which also are often easier to photograph). Subversive can be my middle name (and then my initials will be S.S.S.). Yes, when one takes thousands of photos a month it’s daunting to pay heed to all of them entirely. Glad this one made it in – they’re like tiny feathers! You’re right, Kathy, that dealing with the thousands of pictures I’ve been taking each month is daunting, even if some of the photographs are just slight variants of others—but then I still have to examine a group of similar pictures to see which one came out best. As you point out, the delight of this species is the little feather-like bristles. This made me laugh. I came home with many multiple shots of the same object or view, and the amount of time I spent last night comparing images was — remarkable. And no, I’m not done. It certainly is a good exercise for a not-so-good photographer, though. Making those decisions forces thinking about “Why this, instead of that?”, or “Why didn’t this work, when it should have been such a good photo?” Etc. etc. Welcome to the club, which I suspect has many members, even if almost all of us do our sorting in isolation. The neutral background, completely natural, makes the subject stand out. It makes us see the plant in a completely different way. And an unfamiliar plant, one worthy of being seen, it is. I like that name…nine-anther prairie clover. And I like this image showing off its attractive pluminess too. 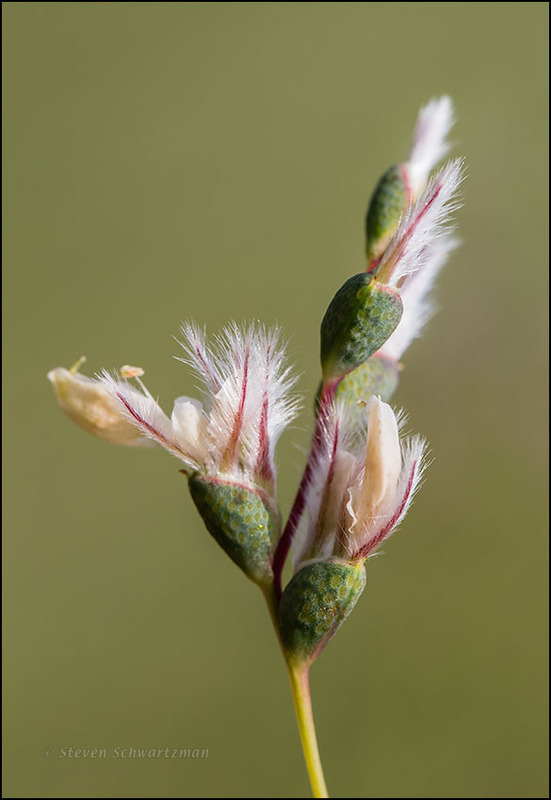 I’m taking the word of online sources that this species is known as nine-anther prairie clover, but it’s an uncommon species here and I’ve never heard anyone refer to it by any vernacular name. Based on its attractive pluminess, I think it should be better known. How well you showcase flowers like these that we may usually just pass by. Seen like this you can really appreciate their feathery beauty. I’m glad I didn’t pass this species by but I wish I saw it more often: I believe I’ve encountered it only twice. I’m impressed that you know this plant, which I believe I’ve seen only twice in Austin, and years apart. The USDA map shows the greatest presence of this species in Kansas, where you saw it. Similarly, the page from Kansas that you linked to has more information about the species than I’ve seen on any site in Texas. That article even talks about the egg-shaped green bracts that are visible in the photograph I posted, though I don’t know that I’d have thought of calling them egg-shaped.